Asiwaju Bola Tinubu, the Godfather of Lagos State politics, has every reason to give Buhari “an Ambode treatment.” The Atiku Challenge is real and bankable. The only option available to the incumbent is rigging! There has been some clarity about Nigeria’s 2019 Presidential election, with the end of the October 7 deadline set by the Independent National Electoral Commission for the conduct of party primaries at all levels. On Saturday, the ruling All Progressives Congress at its convention held in Abuja, ratified the choice of incumbent President Muhammadu Buhari as its flagbearer, with a curious vote tally of 14.8 million. President Buhari and his supporters have continuously left no one in doubt that they intend to have a second shot at power and office. The number of party members across Nigeria who endorsed the Buhari candidacy has however raised eyebrows. 14. 8 million! In the 2015 elections, that was a little less than the same number of total votes that the incumbent got in a nationwide general vote. What is the actual number of persons on the party’s membership register – 15.6 million? Concerned observers have argued that this is an indication of the determination of the ruling party to rig the 2019 Presidential elections, in favour of a 75-year old candidate to whom they insist, there is no alternative. The No-Alternative talk is of course the height of sycophancy and the extent of its idiocy has now been exposed. Just as the APC held its convention over the weekend, other political parties participating in the 2019 general elections were also busy choosing their own candidates, and now we have on the field, the following Presidential candidates: Atiku Abubakar (Peoples Democratic Party), Donald Duke (Social Democratic Party), Olusegun Mimiko (Zenith Labour Party), Omoyele Sowore (African Action Congress), Kingsley Moghalu (Young Progressives Party), Fela Durotoye (Alliance for New Nigeria), Tope Fasua (Abundance Nigeria Renewal Party), Eunice Atuejide (National Interest Party), Adesina Fagbenro-Byron (Kowa Party), Eniola Olajuni (Alliance for Democracy), Gbenga Olawepo-Hashim (Alliance for People’s Trust), Obadaiah Mailafia (African Democratic Congress), Alistair Soyode (Yes Electorates Solidarity), Hamza A-Mustapha (People’s Party of Nigeria), Chike Ukaegbu (Advanced Allied Party), Ahmed Buhari (Sustainable National Party), Usman Ibrahim Alhaji (National Rescue Movement), John Ogbor (All Progressives Grand Alliance), Yabagi Sani (Action Democratic Party), Moses Shipi (All Blending Party), Peter Nwangwu (We the People of Nigeria), Edozie Madu (Independent Democrats) and Obiageli Ezekwesili (Allied Congress Party of Nigeria). Twenty-six presidential candidates so far, except any one has been overlooked in our list. What we know is that this is probably the most demographically diverse Presidential contest line-up in Nigerian history – an indication of the people’s determination to participate in the country’s political process at the highest level. From a 35-year old Ukaegbu to Buhari who is officially 75, the refrains in Nigeria’s emerging democratic process, deducible from the names of the political parties are “action”, “progressive”, “new”, “renewal”, “alliance”, “sustainable”, “rescue”, “people”, “democracy”, “democratic”, “blending”. This is in keeping with the mood of the opposition in the country. The people, as reflected in the political parties’ nomenclature, want a new Nigeria, change and progress. It is an obvious comment on the performance of the incumbent administration. The point has been made, and it is a useful one, that whereas there has been increased interest in the Presidential race, particularly given the number of young candidates inspired by the Not-Too-Young-To-Run law that was passed in May 2018, in reality, the 2019 Presidential race in Nigeria is bound to end up as a two-horse race. Only two of the many political parties- the APC and the PDP- have the following, the structures, resources, and the necessary brand recognition to be able to put up a good showing. The PDP was in power from 1999 to 2015. It was displaced in 2015 by an alliance of political parties that took the name: All Progressives Congress. Today, the APC is the party in power and its candidate is President of Nigeria. Both the APC and the PDP are in charge at the state level and they both control the majority of seats in legislative assemblies across the country. Many of the other political parties in the race are products of alliances and mergers but as at this moment, there is not yet a compelling alliance or merger, such as in the case of the APC in 2015, that can threaten the dominance of two political parties – the APC and the PDP. Some of the emergent Presidential candidates are political tyros, but who nevertheless bring a freshness of ideas and style to the unfolding contest. What we see with plain-sight certainty is that the 2019 Presidential election in Nigeria is bound to be a strong fight between the APC and the PDP and between former Vice President Atiku Abubakar and President Muhammad Buhari, indeed more of a beauty contest between the latter. There is not much difference between the two political parties, Nigeria’s politics is hardly driven by any ideology only by symbols. The APC uses the broom as a symbol, the PDP the umbrella, that is the only known difference, the truth is that members of the two were all either a member of one or the other at a point in their political careers. Former Vice President Atiku has been in both parties crossing from one to the other in the last four years. President Buhari has been previously a member of the ANPP, later the CPC, before joining the APC. While the people may not see a difference between six and half a dozen, they will make a choice on the basis of the personalities and perception of the two leading candidates. Except the unexpected occurs, the next President of Nigeria will either be incumbent President Buhari, who will be running for President for the fifth time, or Alhaji Atiku Abubakar who previously sought the same office, without success. Both candidates are of Northern and Fulani extraction which fits into the country’s unwritten geo-politics. Atiku is from the North East state of Adamawa. Buhari is from the North Western state of Katsina. To the average, majority-group, Northern voter, a major calculation in Nigeria’s ethnic and religious politics, the emergence of Atiku and Buhari means that power will remain in the North for another four years if Buhari wins, and possibly eight years more if Atiku wins. Both men are also Muslims. Both men are also septuagenarians. Atiku is 71. Buhari is 75. The younger Presidential candidates will seek to make heavy weather out of this, but it may not count for much in the contest. Both men have had significant experience at the highest level: Buhari as military Head of State (1983-85) and Atiku as Vice President to President Olusegun Obasanjo (1999 -2007). One of the major issues to look forward to is the health status of the two main candidates. The incumbent has been in and out of hospital in the course of the last three years, spending close to 100 days out of the country in one notable instance. Atiku in comparison, appears much healthier, except any damaging medical report shows up before the crucial vote. Buhari’s handlers have lost the “No-Alternative” argument. On paper and going by the facts, Atiku presents a very formidable alternative. His emergence as the standard-bearer of the PDP is strategic. PDP members have chosen wisely. The PDP has been struggling for survival since it lost power at the centre in 2015. The return of some of the key politicians who defected from the party: including Senator Rabiu Kwankwaso, and Senator Bukola Saraki helped to place the party on the path of revival. Atiku’s emergence as Presidential candidate has strengthened that process. Atiku has all that it takes to build bridges across the divides within the party and lead a robust campaign against President Buhari. The President’s men will seek to campaign on the platform of integrity. They will argue that Buhari deserves a second term because he has been able to wage war against corruption. They will paint Atiku as greedy and corrupt, and insinuate that a vote for both the PDP and Atiku will be a vote for corruption. This is at best a time-bound cliché. The Atiku team should be able to mobilise compelling and damaging counter-narratives. The Buhari campaign is vulnerable on another score: performance. President Buhari came to power in 2015 with the promise that he would run a government of CHANGE, offer Nigerians a better life and greater hope. He was seen as a messiah. For the first time in his bid for the Presidency, he was embraced by every major constituency in the country. Better known as a provincial political leader, he received impactful support from the South West, the East and the North, and was projected as a truly national politician and a remodeled democrat. But as it happened, Buhari and the APC over-promised and under-delivered. They promised to fight corruption. Public opinion is grossly divided on that. They said they will fix the economy. They have presided over one of the worst economic seasons in Nigerian history. They were sure that security would no longer be a problem given Buhari’s background as a military leader. Instead, Nigeria’s security problems became worse. In 2014/2015, Buhari had the support of Nigeria’s former leaders – military and civilian – who thought he would make a better President than President Goodluck Jonathan. He has lost that support. He has since received letters asking him to shape up or ship out, or better still, to forget seeking a second term in office. He has not heeded that advice. Civil society has also changed its mind about the promise that he held out. The international community is not impressed either. On all counts, Atiku Abubakar stands a good chance. In Nigerian politics, the maxim that “the taste of the pudding is in the eating” also rings ever so true. But his golden moment lies ahead of him. Fears that his emergence as PDP Presidential candidate could cause friction within the PDP did not materialize. The other interested candidates not only embraced him, they promised to work with him to ensure the victory of the PDP in 2019. Atiku has the support of Nigeria’s leadership elite, including the extremely influential class of retired Generals. His boss, President Olusegun Obasanjo who once wrote him off has not objected to his emergence. Obasanjo is an astute political pragmatist. He has not minced words in saying that Buhari does not deserve a second term. He clearly also understands that personal differences apart, an Atiku Presidency will in many ways, be an extension of the Obasanjo legacy. If there is any other political legacy that Atiku knows, it invariably hacks back to Obasanjo. Atiku came to limelight through the Shehu Yar’Adua political machinery: the People’s Front of Nigeria (PFN) which later became the People’s Democratic Movement (PDM). Yar’Adua who was murdered in prison, by the Abacha government, used that platform to build bridges across Nigeria. Obasanjo was Yar’Adua’s friend, they were both Abacha’s prisoners, and he would later prove his loyalty to the man who previously served him as Chief of Staff, by anointing his junior brother, Umaru Yar’Adua as Nigeria’s President in 2007. It was Atiku Abubakar not Umaru Yar’Adua who inherited the Shehu Yar’Adua political machinery. In fairness to Atiku, he has kept that machinery alive, oiling it, over the years, such that there is no part of Nigeria where you do not have a PFN-PDM cell. Atiku’s emergence has automatically re-activated those cells. In comparison, Buhari has no political machinery of his own other than his folk hero status among Northern youths. The educated ones among those Northern youths are now rebelling against him. There is a class of young Northern intellectuals, educated in some of the best universities around the world who have the capacity, I mean the intellectual heft, to assess every argument or proposition on its own merits. They have turned against Buhari. They resent the triumph of the stereotypical Northerner under his watch. They feel insulted. They are unimpressed by the small games that Nigerian politicians play. They, not even the Lagos-Ibadan press will be Buhari’s main undoing in the months ahead. I cannot confirm that they are over-awed by Atiku either. They will probably classify him as a better representative of the North. Atiku is cosmopolitan. He has since leaving office in 2007, opened himself up to ideas, and the modernist world. Significantly, he has not branded himself as a cattle-rearer. He has investments in education, agriculture, maritime and other sectors of the economy. There has been no complaint about his emergence as PDP Presidential candidate from Corporate Nigeria – that wing of Nigerian politics populated by deluded egoists who think money is everything- and that is understandable. Corporate Nigeria knows that its leaders can have a comfortable conversation with Atiku because he has a working and practical knowledge of how the Nigerian economy works. He once headed the country’s Economic Management Team and he superintended over Nigeria’s privatization process. Nobody will have to speak to him in Hausa language to explain the meaning of simple economic terms. 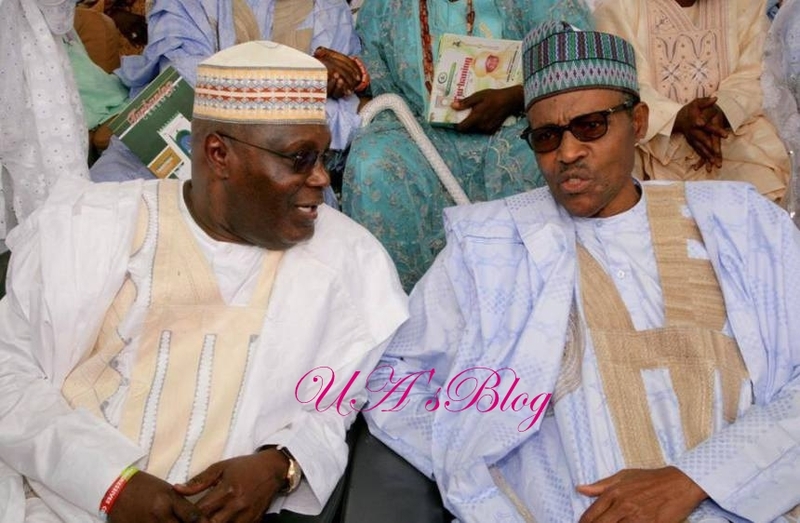 Politically, even members of the ruling All Progressives Congress see Atiku Abubakar as one of their own. There is no major player in this country who has not had the opportunity of interacting with Atiku at one level or the other. To every other constituency, Atiku is saying that Nigeria must be restructured. He poses a real threat to President Buhari’s second term ambition. Senator Kwankwaso, now the main PDP politician in Kano State, will divide the votes in Kano in Atiku’s favour. The South East and the South South may not vote for Buhari. In the South West, Asiwaju Bola Tinubu, the Godfather of Lagos State politics, has every reason to give Buhari “an Ambode treatment.” The Atiku Challenge is real and bankable. The only option available to the incumbent is rigging! While nobody in the Buhari camp can afford the luxury of laughter, me, I just dey here dey laugh. I will tell the story in print and on television.